FALLON, Nev. (Feb. 10, 2015) Master-at-Arms 2nd Class Shane Miles communicates with Master-at-Arms Ryan Young as they clear a passageway during an active shooter exercise at Naval Air Station Fallon during the Navy-wide force protection exercise Solid Curtain-Citadel Shield 2015. (U.S. Navy photo by Mass Communication Specialist 1st Class Joseph R. Vincent/Released). The U.S. Navy said to expect tight security and traffic congestion at San Diego installations through this week beginning today because of a nationwide exercise. 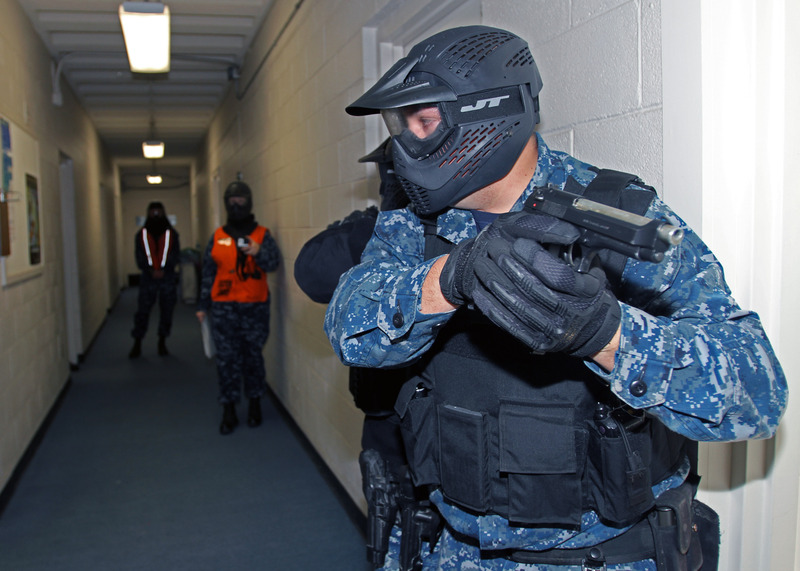 The annual Exercise Solid Curtain-Citadel Shield is designed to enhance training and readiness of Navy security personnel to respond to threats. This exercise is not in response to a specific threat, but is regularly scheduled, the Navy said. The need for such training was dramatically illustrated last month when someone at the Naval Medical Center in Balboa Park heard what sounded like gunshots, drawing a massive military and law enforcement response. No evidence of gunfire was discovered, though. 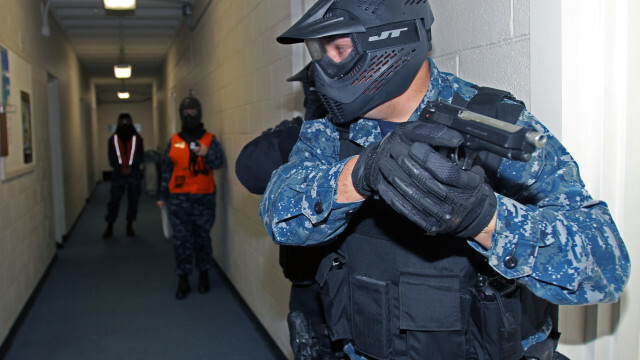 Last week, the Space and Naval Warfare Systems Command in San Diego conducted a drill with the San Diego Police Department and its Emergency Negotiations Team, which consists of personnel from the SDPD, FBI and Naval Criminal Investigative Service. Naval personnel and civilian employees will find elevated force protection conditions and heightened security measures at all bases through Friday, the Navy said. Authorities said steps have been taken to minimize disruptions, but increased traffic around the bases or delays in base access may occur.